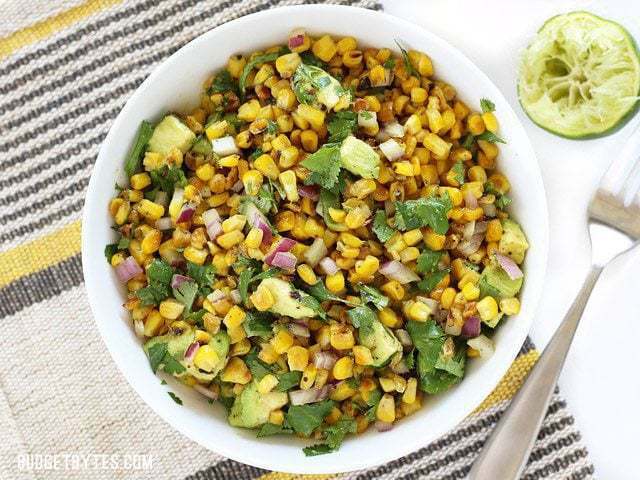 Had this with your taco rice and grilled chili lime chicken from The Recipe Critic. Made for an amazing meal! 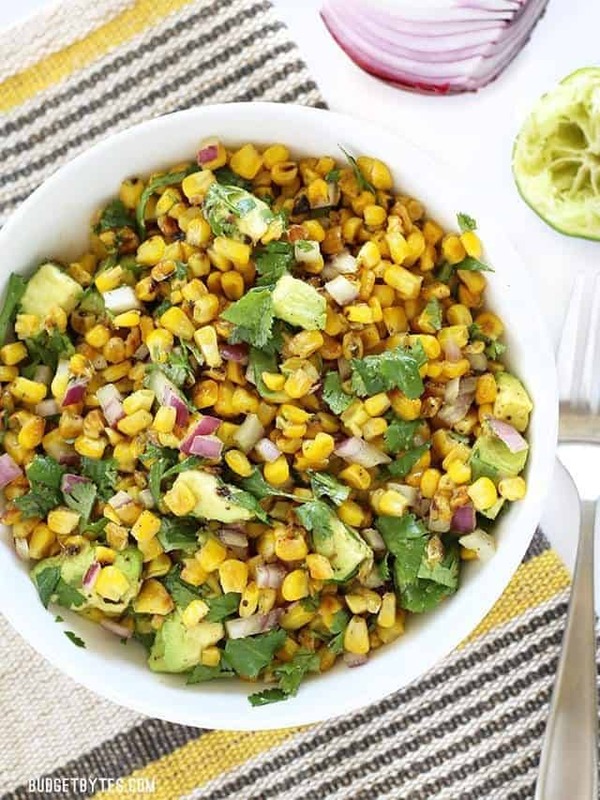 I had a couple ears of fresh corn and half of an avocado languishing in the fridge from the weekend. 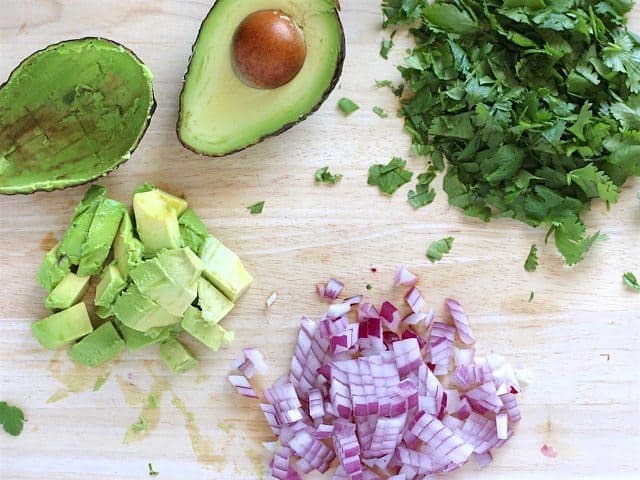 (And all the other ingredients as well). So I made half a recipe. It was yummy! I’ve made similar salads, but always served cold. I loved this one warm. I made this for dinner tonight to go along with the Easy Oven Fajitas (amazing, by the way), and it was really good! My husband doesn’t like raw onion, so I sautéed it with the corn for a few minutes. I used sweet onion instead of red. Next time I’m going to try adding some chopped jalapeño. 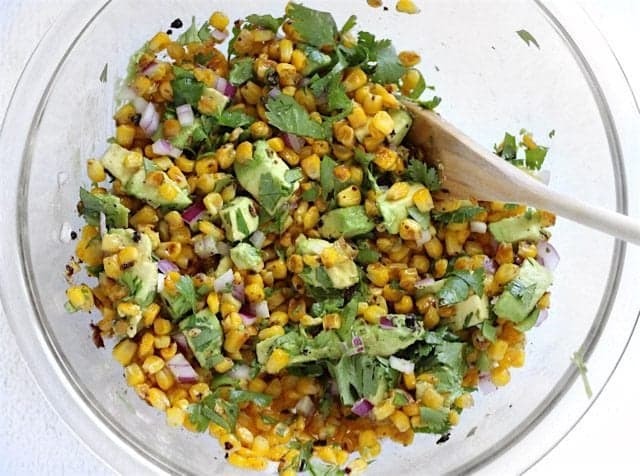 Why do you use frozen corn instead of canned in most of your recipes? It tastes waaaayyy better in my opinion. 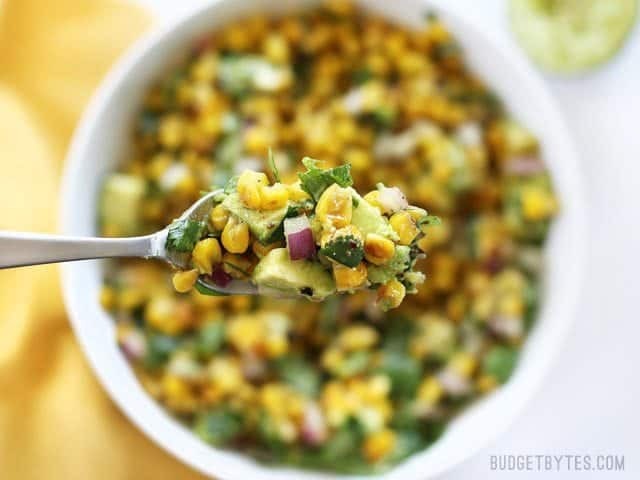 :) It’s really close to fresh corn in both texture and flavor, whereas canned corn is often waterlogged and the liquid it is canned in often contains extra salt and sugar, which change the flavor. OMG! 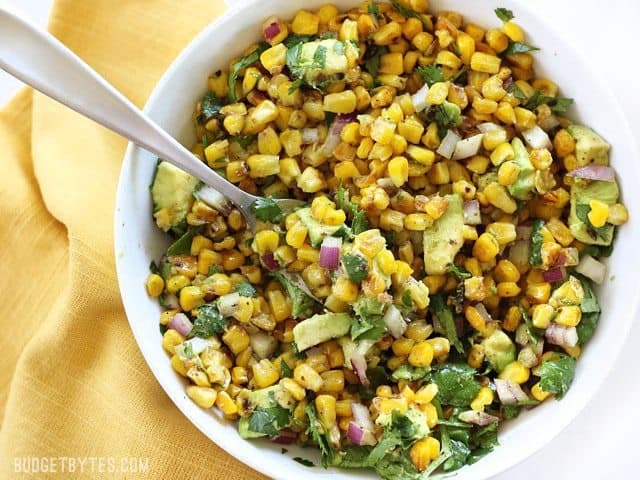 I made this and put it in crispy tacos (with the salsa recipe)… Sooooo good! I doubled the recipe and added tomatoes. I thought it was pretty easy to make and tasty. I’m not sure if it was just the frozen corn I got, but I would have liked my corn kernels to be crispier instead of kind of mushy. Maybe the only way to achieve that is with fresh corn. 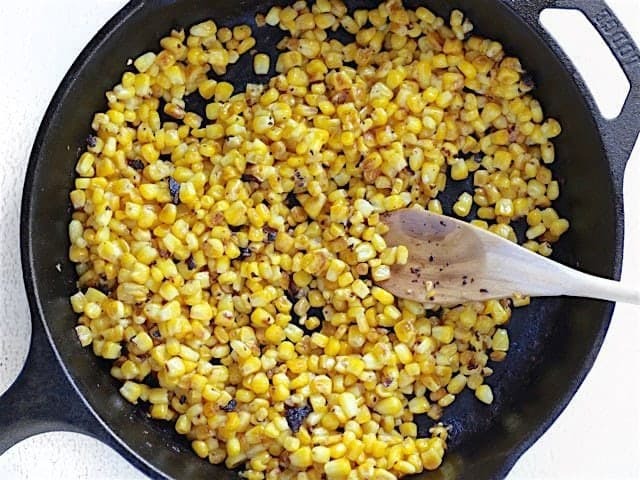 Yep, you definitely need fresh corn to get that crispy texture. When vegetables freeze the ice crystals damage the cell walls making them softer once thawed. 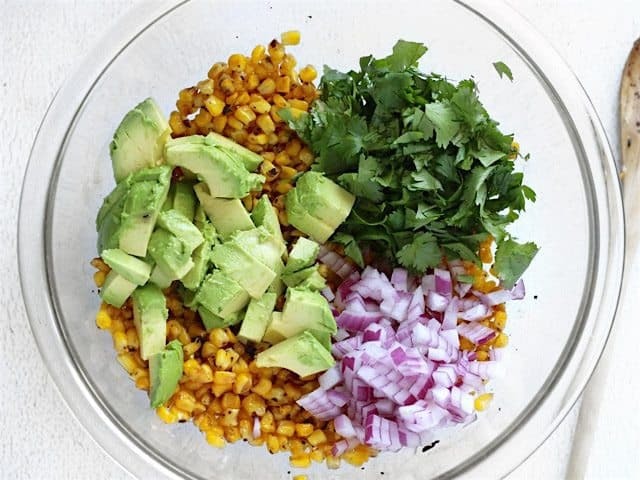 we had a ton of fresh corn on the cob, so i made this salad over the weekend. Delish!!! Made this as a side for our weekly meal prep, and I love it. I substituted green bell pepper for avocado because my husband doesn’t do avocado, but it’s still good. 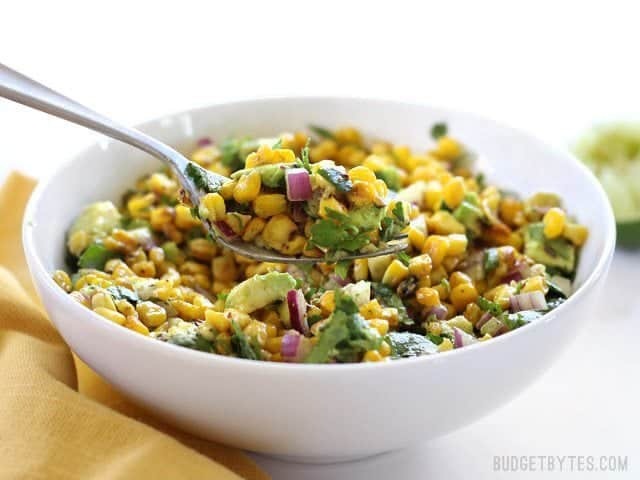 For the record, if you have leftovers and like salsa con queso, if you use the corn salad as the salsa part of your queso dip, it’s really awesome.